Take some wood. Add styrene, wires and words of friendship. What do you have? A buddy bench for kids at the not-for-profit Art City in St. James Town. The project was part of an introductory course in urban studies where U of T undergrads chose to work on one of 11 opportunities around the city. 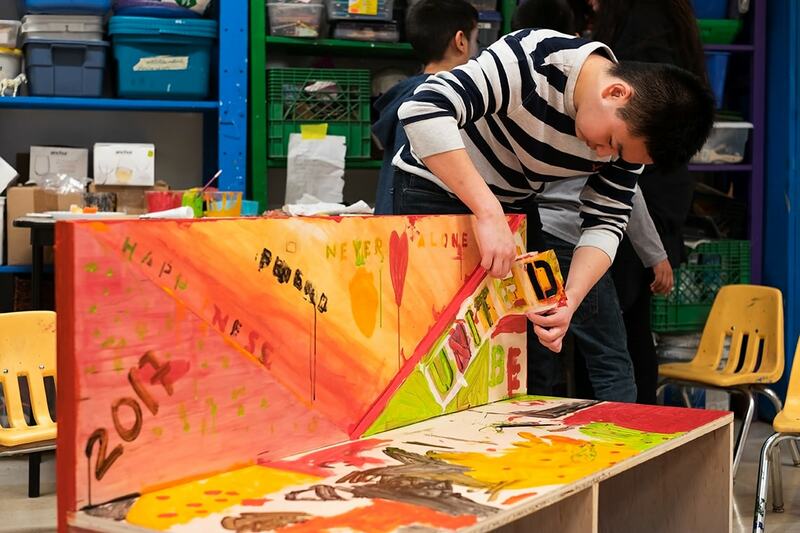 In St. James Town, considered the largest high-rise community in Canada and one of 13 “economically deprived” neighbourhoods in the city, a group of U of T students worked with young artists to visualize and design colourful benches created with architecture software. “It’s to facilitate friendship and allow someone who is feeling lonely to have a seat and be approached by someone else, so that everyone feels welcome in the community,” explained Josh Estrella, a U of T architecture and urban studies student in the course. The Art City kids settled on an origami-style bench with right-angle triangles across the back. To make the bench more inviting, they chose a warm colour palette of oranges, yellows and reds and stencilled on hearts. “For the kids, this is a meaningful project now and into the future,” said Orev Katz, Art City’s director. If not for the extra help, she said Art City might not have had the time to explore different materials and designs to suit the children’s needs and tastes. “We were able to make it in unique and fun ways because the students from urban studies had that skill set,” Katz said. For the undergrads, the experience was an opportunity to get to know the neighbourhood. As part of their homework, Katz asked them to research the neighbourhood, walk around and take note of their surroundings. “I hope they got to learn more about this neighbourhood and how it works, the amazing vibrant culture here and its kinship networks,” she said. Before working on the buddy bench, architecture student Tashiana Lusterio had rarely set foot in St. James Town, she said. The Art City project was one of the projects students could choose from in assistant professor David Roberts’s class. They also had the option to help survey commuting habits of students and staff at U of T Scarborough, or to chart rising property values in Kensington Market to study gentrification. Students who preferred to write a conventional term paper instead, could do so. For any students who are new to Toronto, the community project is a good way of getting the lay of the land, Roberts said. “I think it’s also a way to connect what we’re doing in the classroom to actual real-world experiences, and identify needs that community groups put together,” he said.